This year marks the 15th edition of the Fiera delle Campanelle, which means the Fair of the Bells. 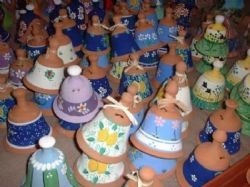 This charmingly named exhibition has bells of all kinds, and features those seen in the photo, which are made of terracotta and hand decorated in the local style in all the colours of the rainbow. The fair is accompanied, according to the website text by “the tinkling of bells” and is held in the former Teatini Convent, a Baroque building dating back to 1586 which is used by the city of Lecce for all kinds of exhibitions of local arts and crafts. This is a wonderful chance to experience a local craft in a unique setting. When: Sunday 26 May from 10 am depending on the cantina concerned.